There's often opportunity in a beaten-down sector. Our contributors don't think these three stocks fit that bill. These three companies are best-kept at arm's length. At least for now. Image source: Getty Images. And while it's true that often the best time to invest in a cyclical industry is when it's in a downturn, the trick is to invest in high-quality businesses that are positioned for the recovery but also able to ride out a downturn that's yet to truly show signs of coming to an end. We reached out to three of our top contributors and asked them to discuss an oil and gas stock that's best to avoid, and they gave us an offshore drilling contractor with a shrinking book of business and looming debt maturities, a specialty products manufacturer with a struggling business that needs a lot of things to go perfect to turn around, and a "big oil" player that exclusively focuses on exploration and production -- a tough place to be when prices are low. 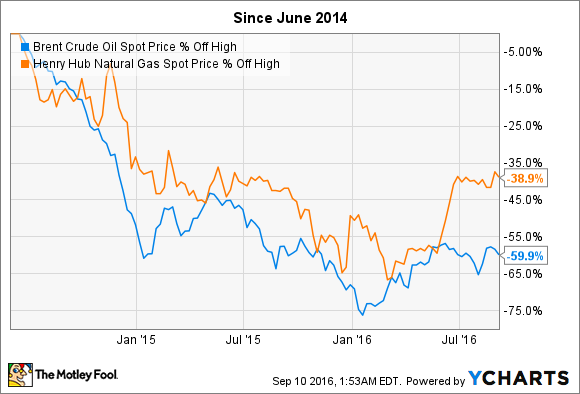 Jason Hall: Like essentially all of its offshore oil and gas drilling competitors, Seadrill Ltd. (NYSE:SDRL) is living on business that it locked up well before oil and gas prices began falling in 2014. Unfortunately, the company's backlog -- also like those of its peers -- continues to shrink with each passing quarter. Seadrill finished the first quarter of the year with a $4.3 billion contracted backlog, but that number had declined $700 million by the end of the third quarter, to $3.6 billion. At the current rate, Seadrill's backlog is on track to decline another $1.4 billion by year-end, leaving the company with only $2.3 billion in contracted revenue for 2017. Considering that the company must repay or refinance $450 million in debt before the end of 2016 and another $2 billion by June 2017, things could go from bad to worse very quickly if offshore oil producers don't start showing some appetite for new spending in the very near future. Seadrill has $1.3 billion in cash on hand, and that will help the company ride out the downturn a little further. But until the cycle bottoms and the investment freeze in offshore projects thaws, Seadrill's place should be on your watch list, not your buy list. Tyler Crowe: There are a lot of stocks that don't look that appealing right now in the energy industry for a multitude of reasons, ranging from being overly reliant on high commodity prices, having too much debt, or just not having a well-managed business. One company that has embodied all of these things in recent years is Calumet Specialty Products Partners (NASDAQ:CLMT), and it's a stock that should be avoided at all costs. The thing that's so discouraging about Calumet is that below the underperforming financials and several management missteps in recent years, there is a niche market that it can profitably service while generating decent returns for investors. Problem is, though, that the company splurged way too much on acquisitions or investing in projects that had questionable futures, all the while piling on debt such that the the company today is taking out loans with 11% coupon rates. The interest payments on that capital are simply too high to ever expect a decent return on equity. To make all this worse, this company is structured as a master limited partnership, so it should be paying some sort of a distribution. Unfortunately, the company has dug itself into such a large hole that it had to suspend its payout. CEO Timothy Go was brought into the company at the beginning of 2016 and has laid out a plan that could put the company back on the right track. For it to work, though, a lot of things will have to go right for the company. For investors, there is just too much risk that the stars won't align just right for Calumet to pull off this turnaround. So investors are just best avoiding this company altogether. Rich Smith: They say bigger is better, and a lot of folks think this is especially true in the world of oil and gas -- Warren Buffett, for example. Yet today, I'm going to go out on a limb and say that one of the bigger companies in the oil patch -- ConocoPhillips (NYSE:COP), a former Buffett fave -- is now a stock to avoid. Why? Let me count the ways. Priced at 76 times forward earnings, ConocoPhillips is actually losing money today and has a negative P/E ratio. Last year, the oil giant booked losses of $4.4 billion. Those losses are growing in 2016, too, with the latest trailing-12-month numbers showing it losing money at the rate of $7.1 billion per year. Cash profits have been negative even longer. The company dipped into negative free cash flow territory back in 2014 (burning through $516 million in negative free cash flow, according to data from S&P Global Market Intelligence) and hasn't come up for air since. It burned through $2.5 billion in 2015, and was still burning cash at the rate of $2 billion a year at last report. Meanwhile, debt has been steadily increasing. From $21.1 billion in long-term debt at the end of 2013, ConocoPhillips' indebtedness increased to $22.4 billion in 2014, $22.7 billion in 2015, and now stands at about $27.3 billion. Weighed against cash and short-term equivalents of $4.2 billion, that leaves the company with more than $23 billion net debt -- nearly half its own market cap. And now here's the kicker: With lots of debt to pay down, no profits or free cash flow to do it with, but a continuing dividend yield of 2.4%, there's even a risk that ConocoPhillips may decide to cut dividends further (it's already begun cutting) to husband its cash. Add it all up, and while ConocoPhillips may well be a "big" oil company, it doesn't look to me like a "good" oil investment at all.